In the wake of the U.S. Environmental Protection Agency’s (EPA) announcement that it will regulate methane emissions from existing sources of oil and natural gas in order to “combat climate change,” it is useful to reexamine a recent study by ICF International and the Environmental Defense Fund (EDF), which many proponents of EPA’s rules have been using to justify the administration’s decision. As Krupp and Woodwell contradictorily acknowledge, natural gas prices are as low as they’ve been in years – more than 50 percent lower than the baseline 2011 price of $4 Mcf used by ICF to calculate methane mitigation savings in the study. Yet they still argue that the rules are affordable based on high natural gas prices, which doesn’t make any sense. Here is a closer look at the three reasons the ICF International/EDF report is misleading. The report claims a 40 percent reduction (163 billion cubic feet) in methane emissions from the oil and gas sector from 2011 levels would save the U.S. oil and gas producers $164 million a year and far outweigh the cost of complying with new regulations. But as the following graphic from the report illustrates, this entire claim is premised on the assumption that natural gas prices are $4/Mcf. 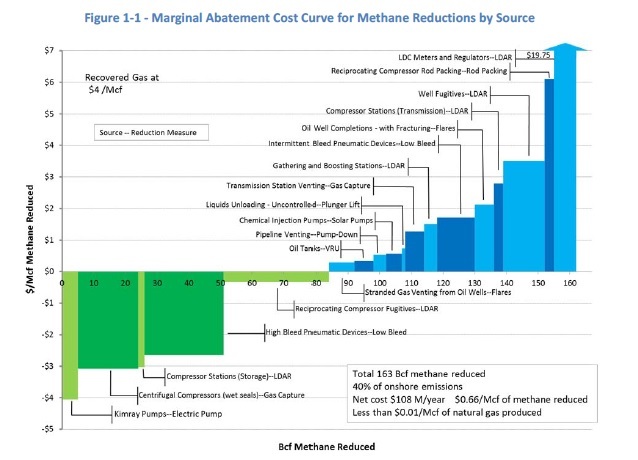 This ICF graphic illustrates how EDF used an unrealistic assumption of $4 Mcf natural gas to misrepresent costs of implementing EPA’s new methane rules. That price is quite far-fetched, considering natural gas prices haven’t reached the $4 Mcf level since November 2014 and have remained well below $3/Mcf over the past 13 months. The Energy Information Administration’s (EIA) analysis of EPA’s Clean Power Plan, released in 2015, projects natural gas prices may not reach $4/Mcf until after 2030, based upon a high oil and natural gas resource base assumption. Even assuming a more realistic $3/Mcf price (which is still much higher than current price) EDF’s net cost more than doubles, according to the report’s own calculations, which were buried on the following graphic located the first appendix on page 70 of the report. 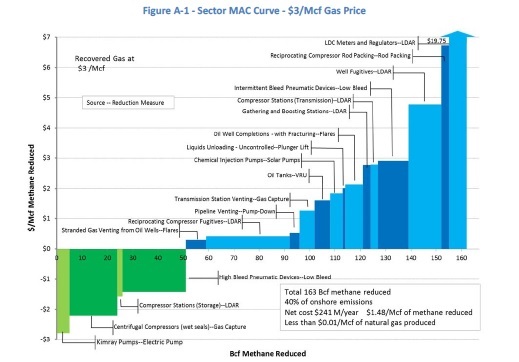 This ICF graphic shows how assuming a more realistic $3 Mcf natural gas price doubles net costs from their $4 Mcf scenario. Furthermore, a scenario using current natural gas prices ($1.79 Mcf as of March 15, 2016) would result in net savings more than $90 million less than the annual savings ICF calculated in its $4 Mcf scenario, while net costs would see a massive increase. The ICF report also forecasts methane emissions from oil and gas activities increasing 4.5 percent from 2011 levels by 2018. That estimate even takes into account EPA’s proposed methane regulations on new and modified oil and gas infrastructure. EPA recently revised its methane emissions estimates. According the 2016 Draft Greenhouse Gas Inventory (tables 3-36 and 3-44) EPA estimates that all U.S. oil and natural gas systems emitted 232.4 million metric tons of CO2 equivalent (MMT CO2 Eq.) of methane in 2013, the most recent year for which data is available. However, these are revised numbers and may be based on flawed assumptions. EPA appears to have taken emissions data from large reporting facilities and simply assumed that much smaller facilities — which do not report to EPA — have similar emissions rates. That considered, it’s important to note that EPA’s 2015 Greenhouse Gas Inventory indicated methane emissions from natural gas production had fallen 38 percent since 2005 at the same time natural gas production increased 26 percent, thanks to the availability and use of hydraulic fracturing. So the notion that methane emissions from oil and gas development are rising is highly improbable, to say the least. More importantly, a recent National Oceanic and Atmospheric Administration (NOAA) study found that biogenic sources of methane, such as livestock and wetlands – not oil and gas production – are responsible for the recent rise in global methane emissions. A separate report from EDF, in partnership with the Rhodium Group, estimates overall U.S. natural gas emissions at 1.3 percent of production. Researchers from the University of Colorado at Boulder and the National Oceanic and Atmospheric Administration have found that methane leakage rates from the Haynesville, Marcellus and Fayetteville shales – which account for more than 50 percent of U.S. shale gas production – are just 1.1 percent of production. 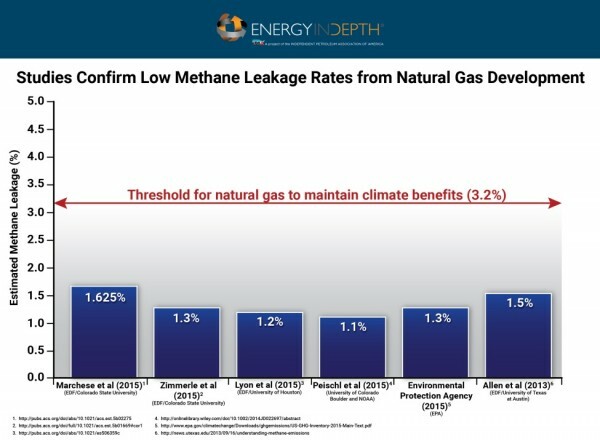 Both figures are well below the threshold for natural gas to sustain its climate benefits and are consistent with several recent reports that find low methane leaking from natural gas development, illustrated in the EID graphic below. This is why the Intergovernmental Panel on Climate Change has acknowledged that, even taking into account methane emissions during production, natural gas still maintains environmental benefits. Bottom line: even if the EDF’s projection of increased methane emissions were true (it’s not) what’s important is that the methane emissions rate is below the threshold for natural gas to have significant climate benefits – and it clearly is. The study takes a bit of hyperbolic license in summarizing the importance of methane emissions and the oil and gas industry’s role in contributing to them. But it is essential to put methane emissions into proper context, both on a domestic and global scale. According to data from the EPA, methane emissions in the United States only constitute about 10 percent of total U.S. greenhouse gas emissions, and that 10 percent figure takes methane’s higher warming potential into account. In 2013, total U.S. greenhouse gas emissions were 6,811.1 MMT CO2 Eq, meaning methane emissions from oil and natural gas systems (232.4 MMT) represent only about 3.4 percent of all the greenhouse gases emitted in the United States. EID research has found that a 45 percent reduction in EPA’s revised 2013 U.S. methane emissions totals would equate to to 92.96 MMT CO2 Eq. by 2025. For perspective, those proposed reductions would reduce global temperatures just four one thousandths of one degree (.0004 celcius) by 2100. That said, shale development’s role in reducing CO2 emissions has done more to mitigate climate change than any government scheme or regulation, far out-trumping the impact of oil and gas methane emissions. Consider that electrical generation accounted for 38 percent of total U.S. energy-related CO2 emissions in 2014, according to the Energy Information Administration (EIA). Increased use of affordable natural gas made possible by the shale gas revolution has helped lower CO2 emissions from the electricity generation sector to 27-year lows. A recent report by the Manhattan Institute shows that natural gas is responsible for nearly 20 percent of total carbon dioxide emission cuts from 2007 to 2013 and that for every ton of CO2 emission reductions attributable to solar power, 13 tons can be attributed to natural gas. That is because natural gas is quickly becoming the electrical generation fuel of choice. It became the leading source of U.S. electricity for the first time in April 2015 and was the top electrical generation fuel in each of the last six months of 2015. So it’s no wonder that the U.S. is the only major country that has seen significant CO2 reductions in recent years. To sum up, the ICF/EDF study uses high natural gas prices to argue the rules are affordable, even though natural gas prices have plummeted. It also projects significantly increased emissions by 2018, which go completely against what the best available data shows us, further exaggerating its projected cost benefits. Finally, the study doesn’t take into account other more major sources of methane emissions. The report appears to have been conducted in a spirit of being constructive, but the facts clearly show that new methane regulations will have little to no effect on global temperatures. They will also be much more costly than EDF has led on. The rules EDF has called for (and EPA is set to make reality) will likely prove as burdensome as they are unnecessary.